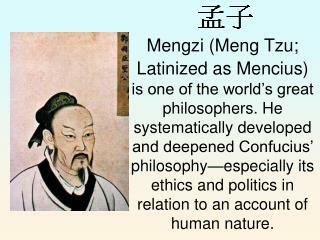 Mengzi (Meng Tzu; Latinized as Mencius) is one of the world’s great philosophers. He systematically developed and deepened Confucius’ philosophy—especially its ethics and politics in relation to an account of human nature. 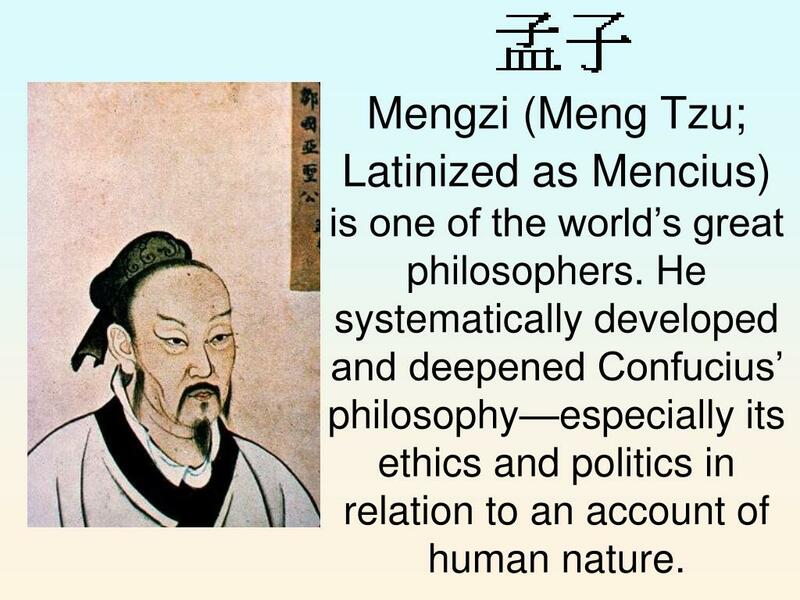 Mengzi (Meng Tzu;Latinized as Mencius)is one of the world’s great philosophers. He systematically developed and deepened Confucius’ philosophy—especially its ethics and politics in relation to an account of human nature. Mengzi (circa 372-289 BCE) is considered the second greatest philosopher in the ru tradition (except by those who prefer Xunzi). Rujia 儒家 is the Chinese term referring to the tradition of the erudites or scholars (sometimes called literati) and is called “Confucianism” in the West. 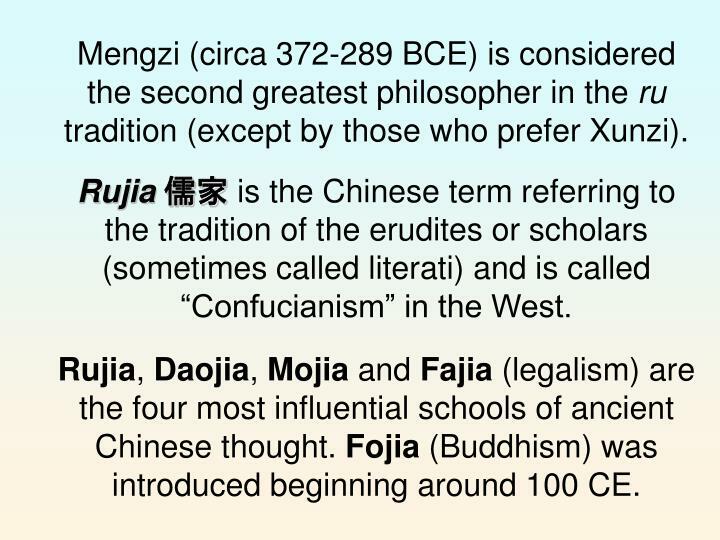 Rujia, Daojia, Mojia and Fajia (legalism) are the four most influential schools of ancient Chinese thought. Fojia (Buddhism) was introduced beginning around 100 CE. 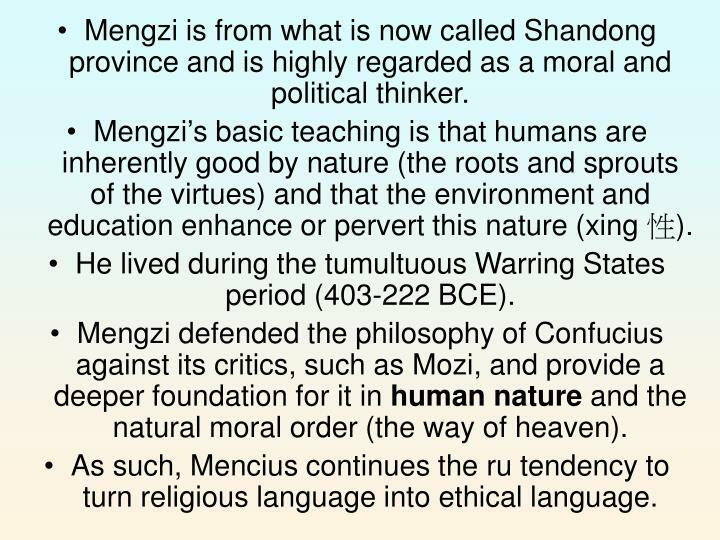 Mengzi is from what is now called Shandong province and is highly regarded as a moral and political thinker. 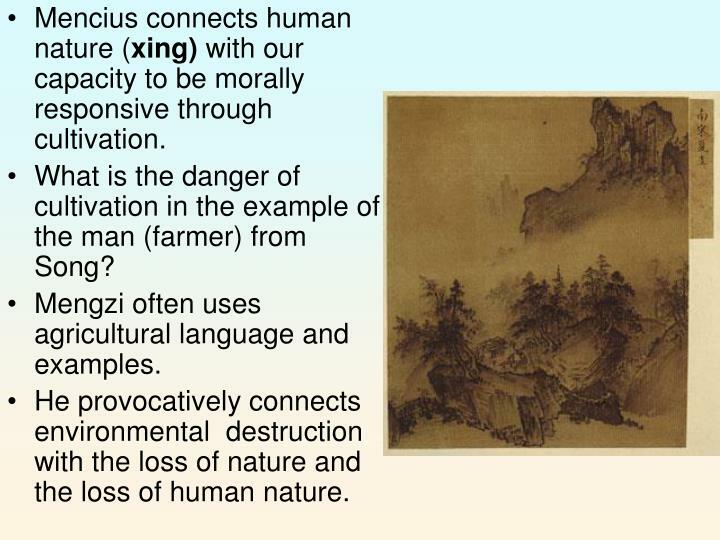 Mengzi’s basic teaching is that humans are inherently good by nature (the roots and sprouts of the virtues) and that the environment and education enhance or pervert this nature (xing 性). He lived during the tumultuous Warring States period (403-222 BCE). 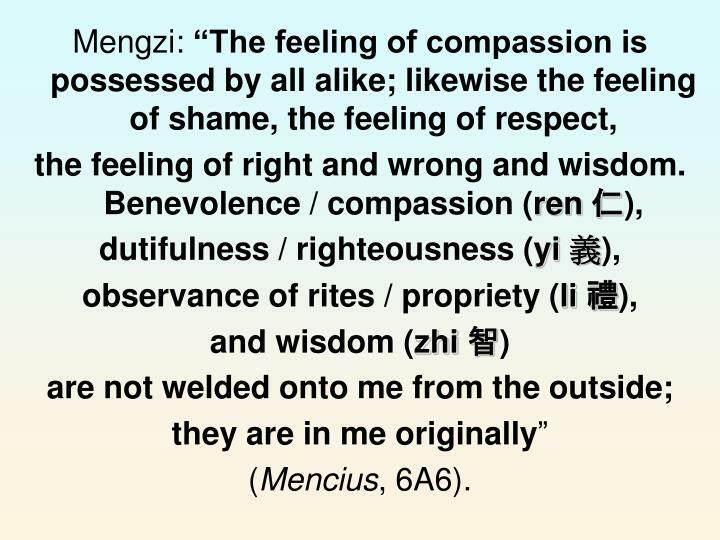 Mengzi defended the philosophy of Confucius against its critics, such as Mozi, and provide a deeper foundation for it in human nature and the natural moral order (the way of heaven). As such, Mencius continues the ru tendency to turn religious language into ethical language. 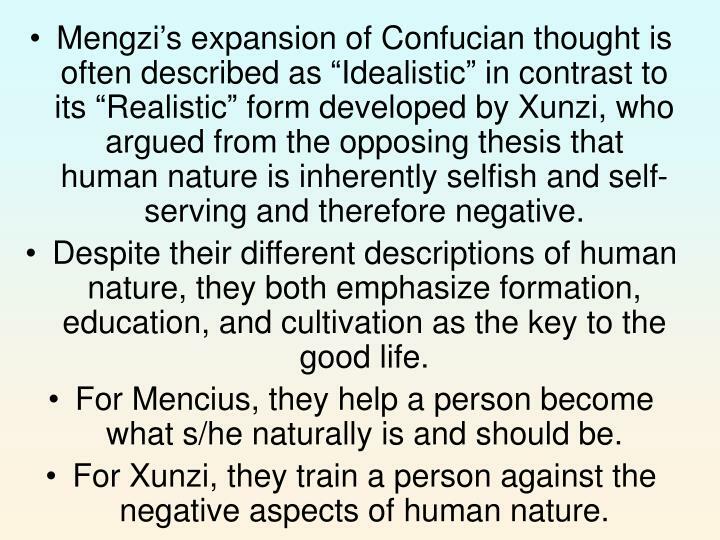 Mengzi’s expansion of Confucian thought is often described as “Idealistic” in contrast to its “Realistic” form developed by Xunzi, who argued from the opposing thesis that human nature is inherently selfish and self-serving and therefore negative. Despite their different descriptions of human nature, they both emphasize formation, education, and cultivation as the key to the good life. For Mencius, they help a person become what s/he naturally is and should be. 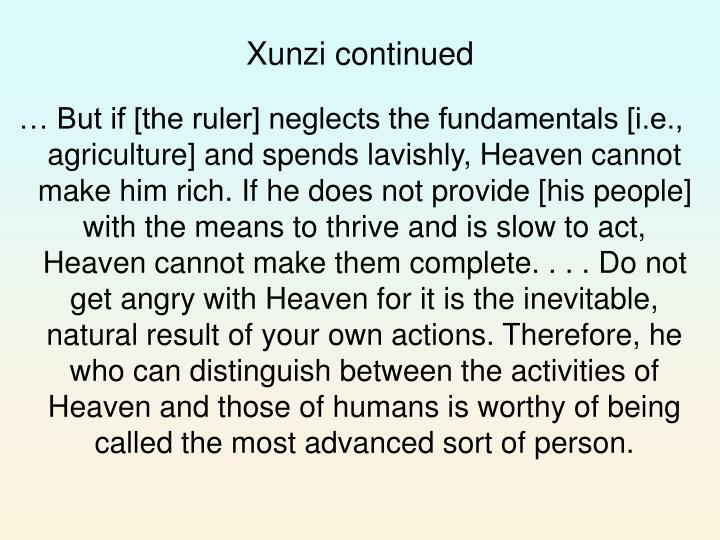 For Xunzi, they train a person against the negative aspects of human nature. Mengzi like Confucius before him traveled to many kingdoms as a political advisor. A number of his recorded discussions are attempts to explain to rulers the superiority of morality over profit and gain. Is virtue independent of profit and ethics of rewards? 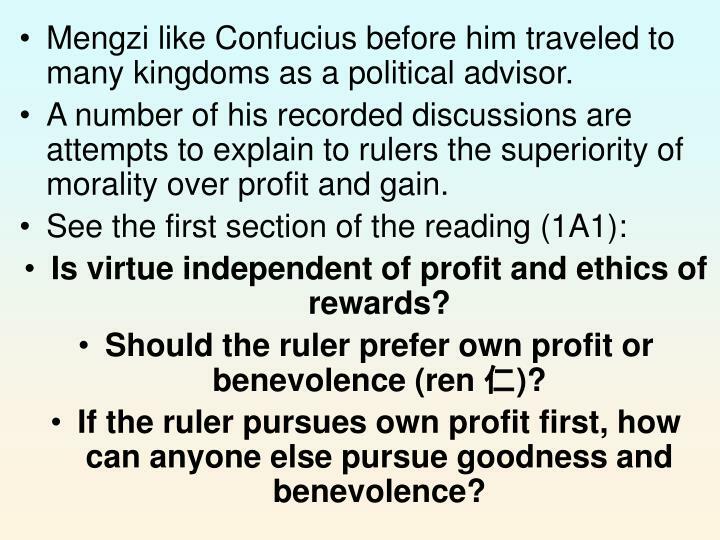 Should the ruler prefer own profit or benevolence (ren 仁)? If the ruler pursues own profit first, how can anyone else pursue goodness and benevolence? 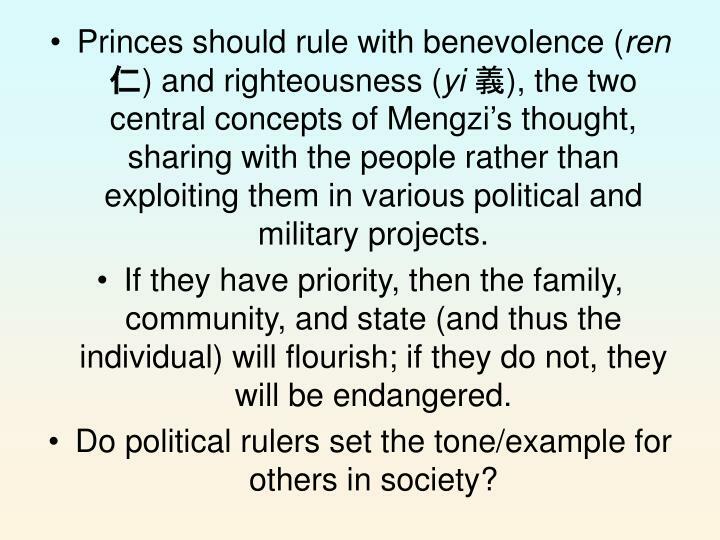 Princes should rule with benevolence (ren 仁) and righteousness (yi 義), the two central concepts of Mengzi’s thought, sharing with the people rather than exploiting them in various political and military projects. If they have priority, then the family, community, and state (and thus the individual) will flourish; if they do not, they will be endangered. Do political rulers set the tone/example for others in society? For Mengzi, the ruler and administrators, etc., set the example for the subjects, and cannot expect of them what they do not expect of themselves. Do you think this thesis is related to Kongzi’s notion of shu 恕? 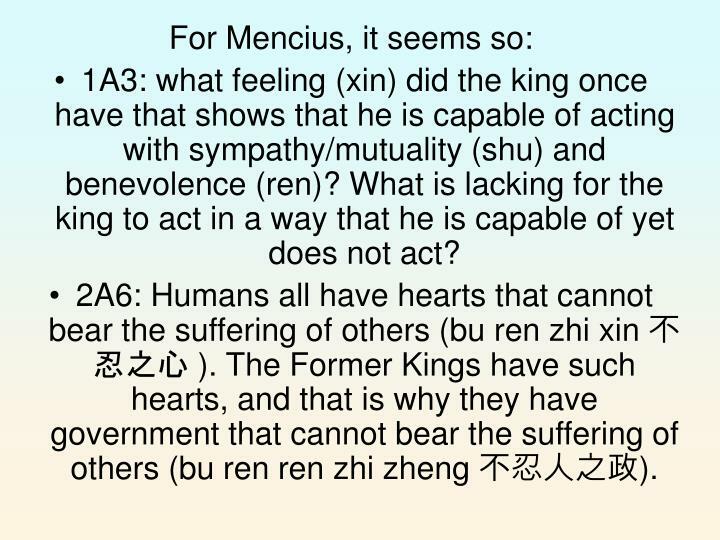 1A3: what feeling (xin) did the king once have that shows that he is capable of acting with sympathy/mutuality (shu) and benevolence (ren)? What is lacking for the king to act in a way that he is capable of yet does not act? 2A6: Humans all have hearts that cannot bear the suffering of others (bu ren zhi xin 不忍之心 ). The Former Kings have such hearts, and that is why they have government that cannot bear the suffering of others (bu ren ren zhi zheng 不忍人之政). 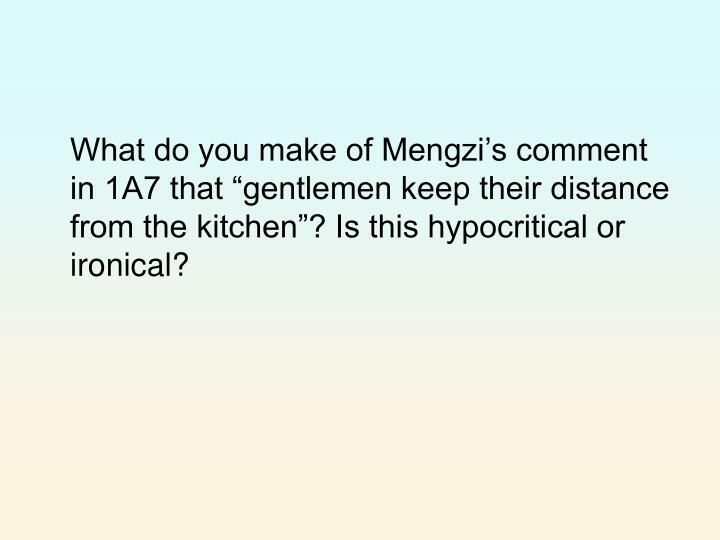 What do you make of Mengzi’s comment in 1A7 that “gentlemen keep their distance from the kitchen”? Is this hypocritical or ironical? What is needed is (1) constancy of heart and (2) the ability to extend (tui 推) from “this” to “that” / here to there / one’s sympathetic understanding from self and loved ones toward others. 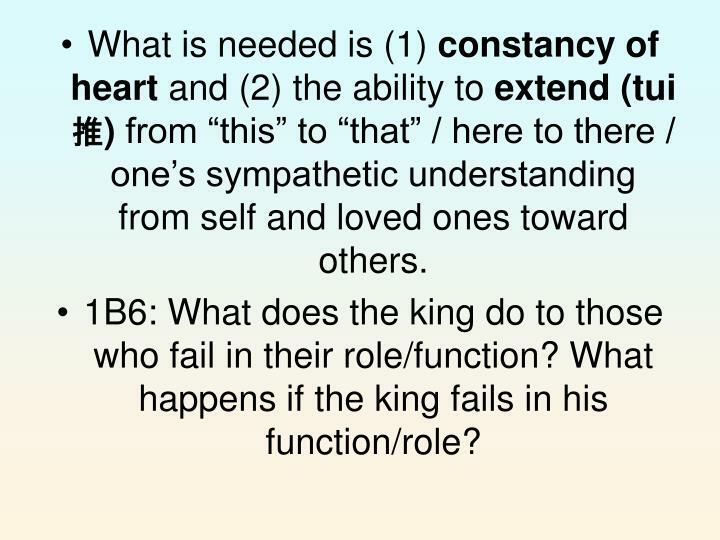 1B6: What does the king do to those who fail in their role/function? What happens if the king fails in his function/role? Is there a moral “right” to resist morally illegitimate leaders? 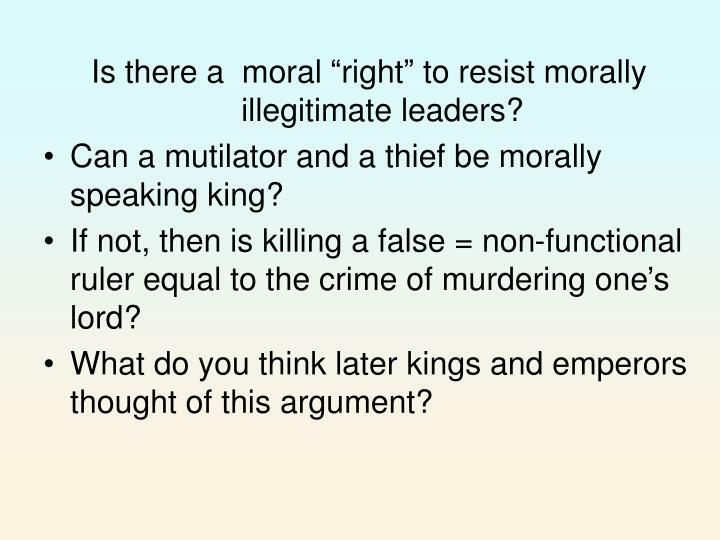 Can a mutilator and a thief be morally speaking king? If not, then is killing a false = non-functional ruler equal to the crime of murdering one’s lord? What do you think later kings and emperors thought of this argument? 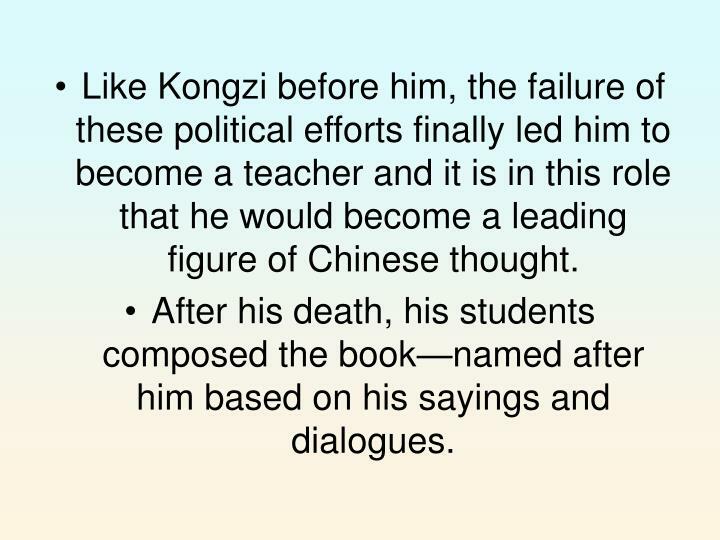 Like Kongzi before him, the failure of these political efforts finally led him to become a teacher and it is in this role that he would become a leading figure of Chinese thought. After his death, his students composed the book—named after him based on his sayings and dialogues. the way of heaven (tian 天). 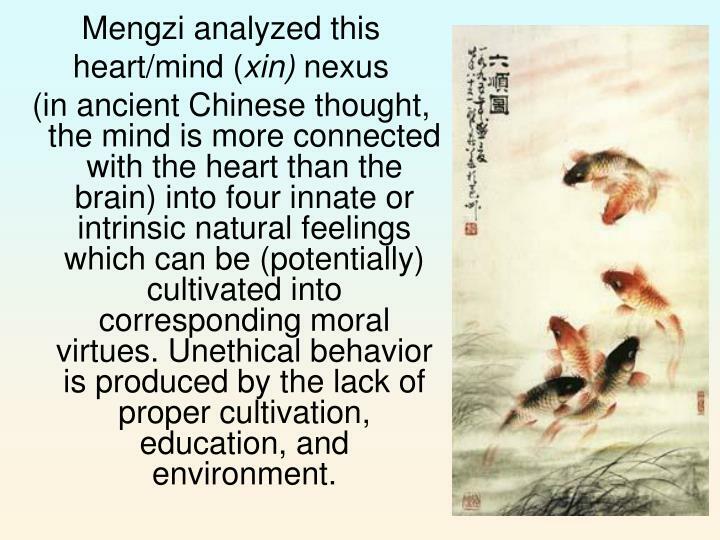 (in ancient Chinese thought, the mind is more connected with the heart than the brain) into four innate or intrinsic natural feelings which can be (potentially) cultivated into corresponding moral virtues. Unethical behavior is produced by the lack of proper cultivation, education, and environment. 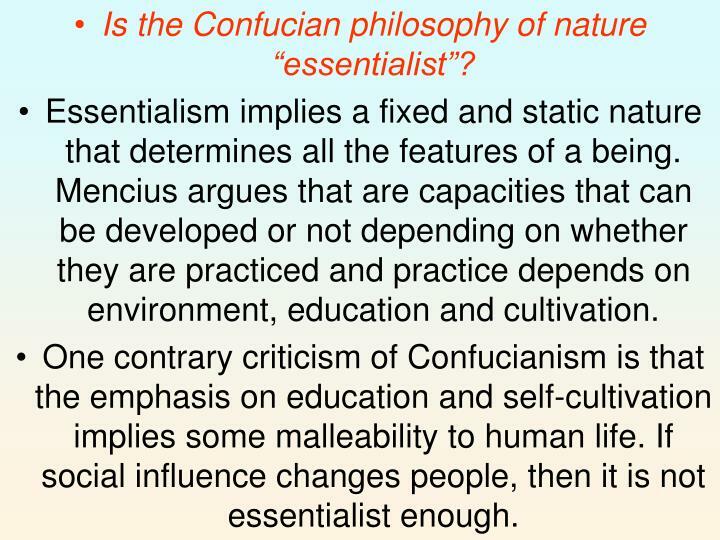 Is the Confucian philosophy of nature “essentialist”? Essentialism implies a fixed and static nature that determines all the features of a being. 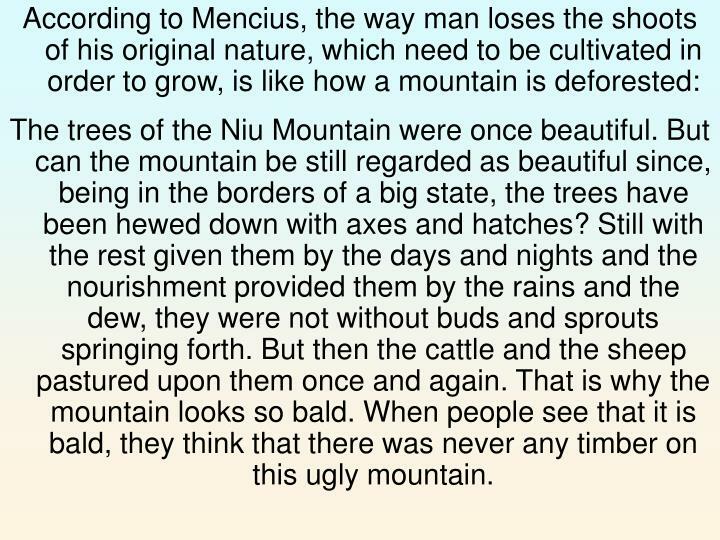 Mencius argues that are capacities that can be developed or not depending on whether they are practiced and practice depends on environment, education and cultivation. One contrary criticism of Confucianism is that the emphasis on education and self-cultivation implies some malleability to human life. If social influence changes people, then it is not essentialist enough. Is it consistent for a position to insist upon both essentialism and the changeability of human life? 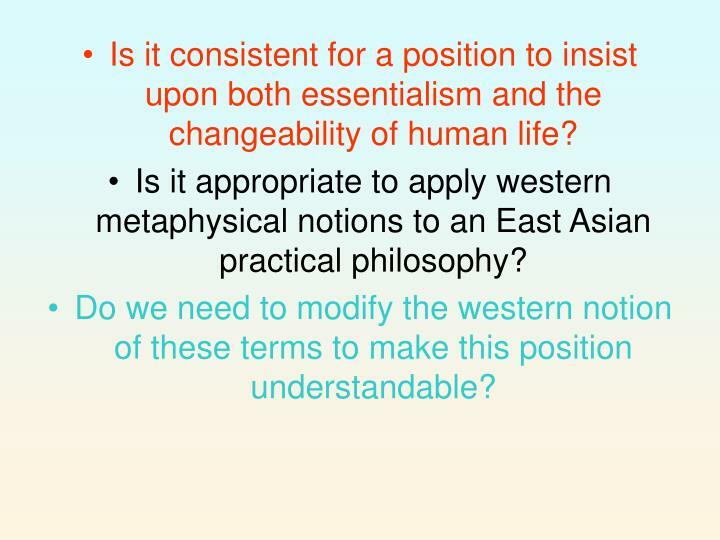 Is it appropriate to apply western metaphysical notions to an East Asian practical philosophy? Do we need to modify the western notion of these terms to make this position understandable? In ancient Chinese thought, xing 性(“nature”) is related to notions such as long life, harmony and balance. It does not indicate what must occur but what may or may not depending on circumstances. Xing is understood morally in the ru and cosmologically in other traditions.For Mencius, xing is the possibility of there being ethics at all, since it asserts that humans have the intrinsic capacity to act ethically. They do because they are morally responsive beings. 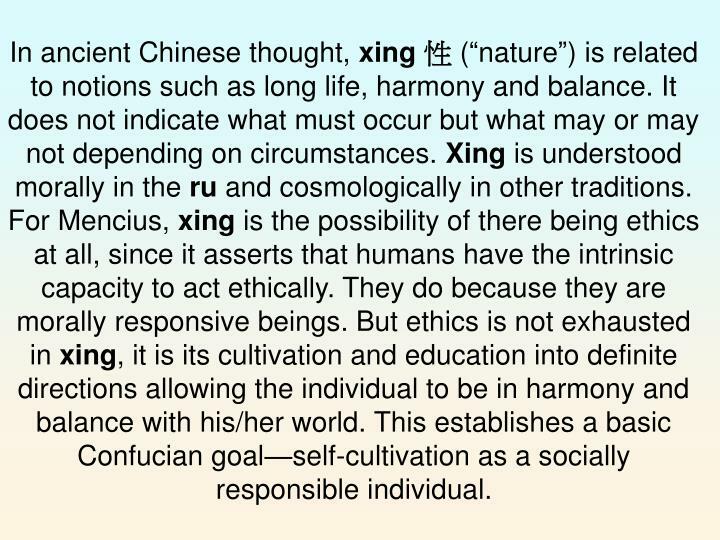 But ethics is not exhausted in xing, it is its cultivation and education into definite directions allowing the individual to be in harmony and balance with his/her world. This establishes a basic Confucian goal—self-cultivation as a socially responsible individual. 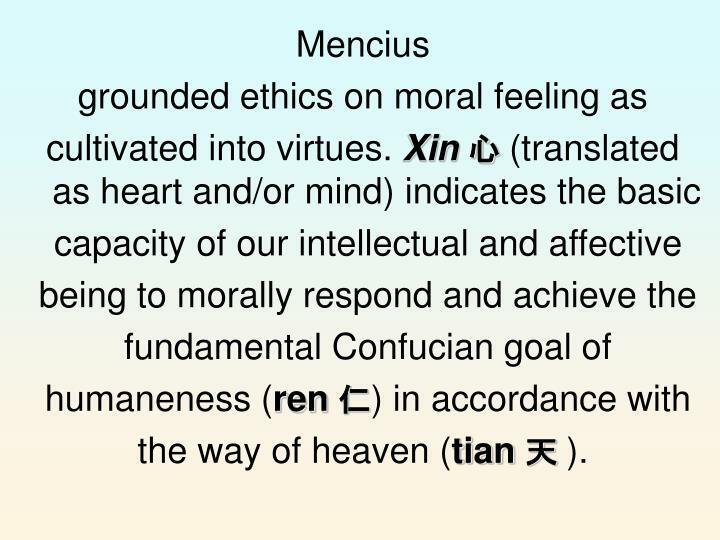 Mencius connects human nature (xing) with our capacity to be morally responsive through cultivation. 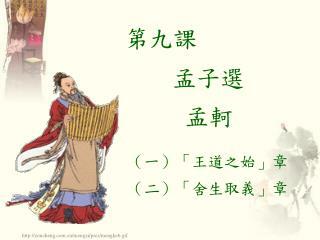 What is the danger of cultivation in the example of the man (farmer) from Song? 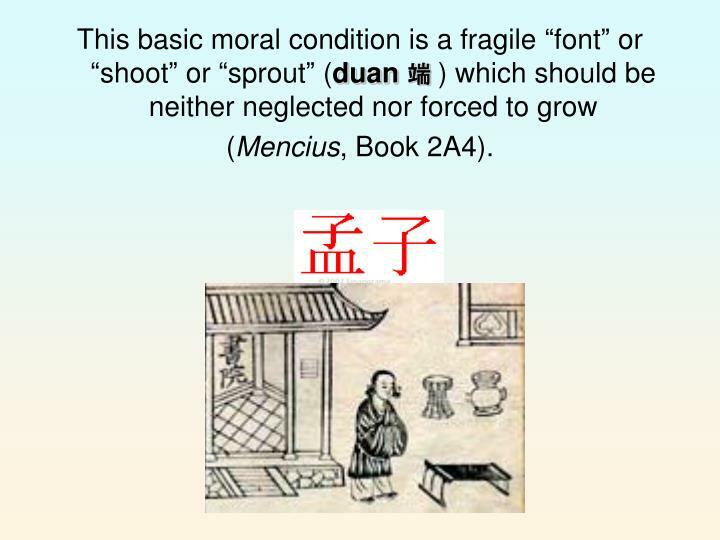 Mengzi often uses agricultural language and examples. He provocatively connects environmental destruction with the loss of nature and the loss of human nature. The trees of the Niu Mountain were once beautiful. But can the mountain be still regarded as beautiful since, being in the borders of a big state, the trees have been hewed down with axes and hatches? Still with the rest given them by the days and nights and the nourishment provided them by the rains and the dew, they were not without buds and sprouts springing forth. But then the cattle and the sheep pastured upon them once and again. That is why the mountain looks so bald. When people see that it is bald, they think that there was never any timber on this ugly mountain. 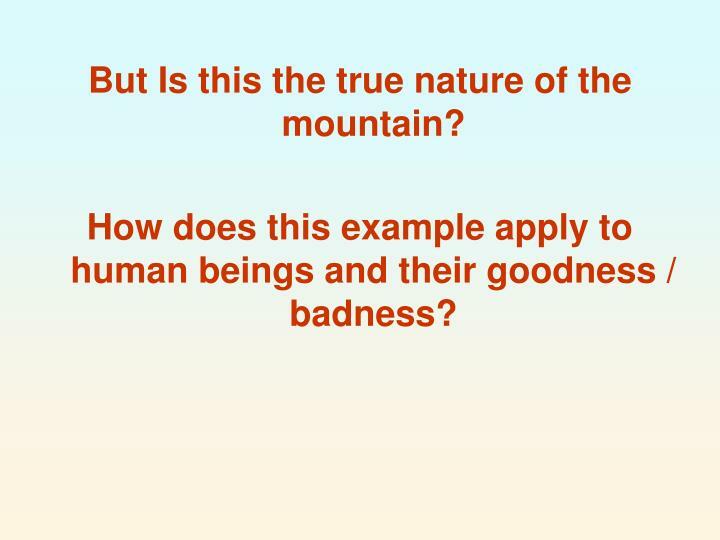 But Is this the true nature of the mountain? How does this example apply to human beings and their goodness / badness? 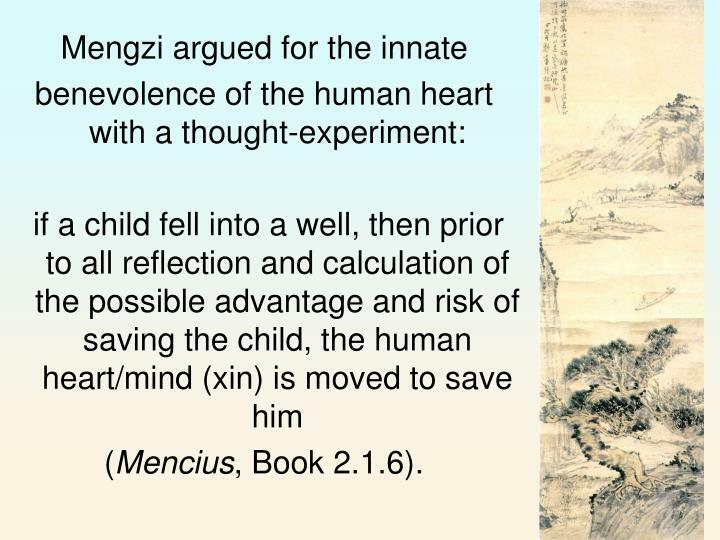 What other examples does Mengzi provide for the goodness of human nature? 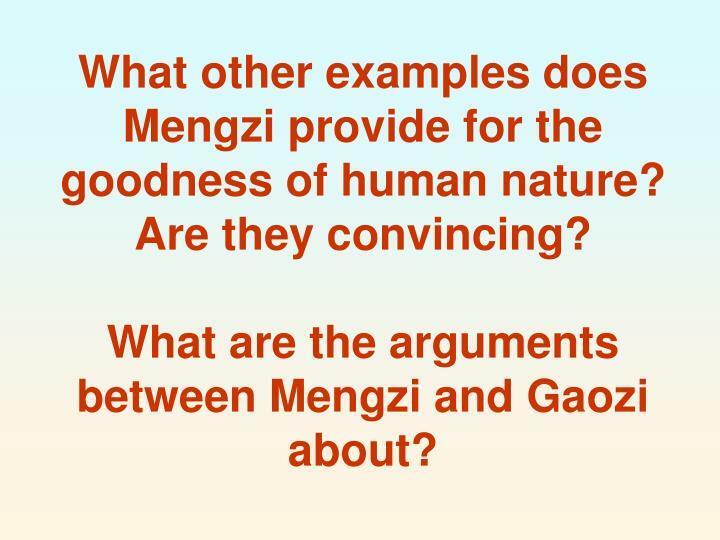 Are they convincing?What are the arguments between Mengzi and Gaozi about? 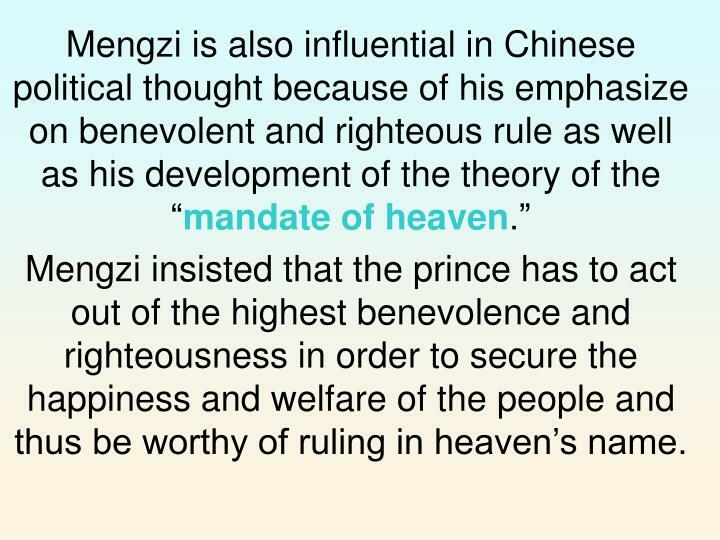 Mengzi insisted that the prince has to act out of the highest benevolence and righteousness in order to secure the happiness and welfare of the people and thus be worthy of ruling in heaven’s name. 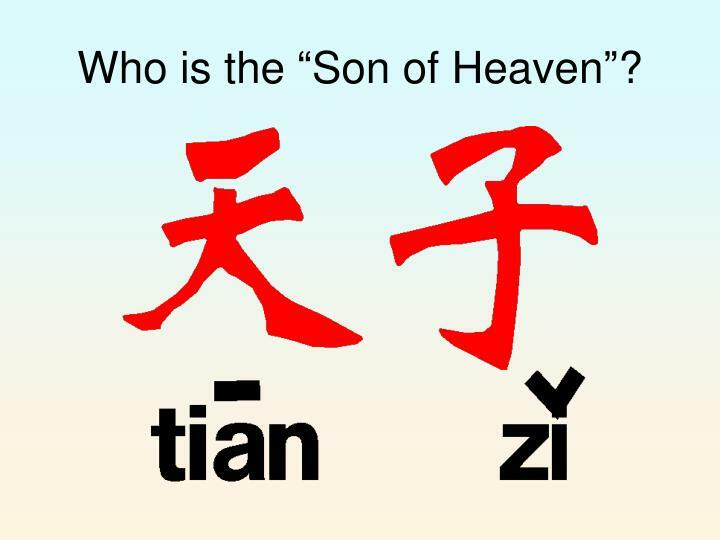 Who is the “Son of Heaven”? 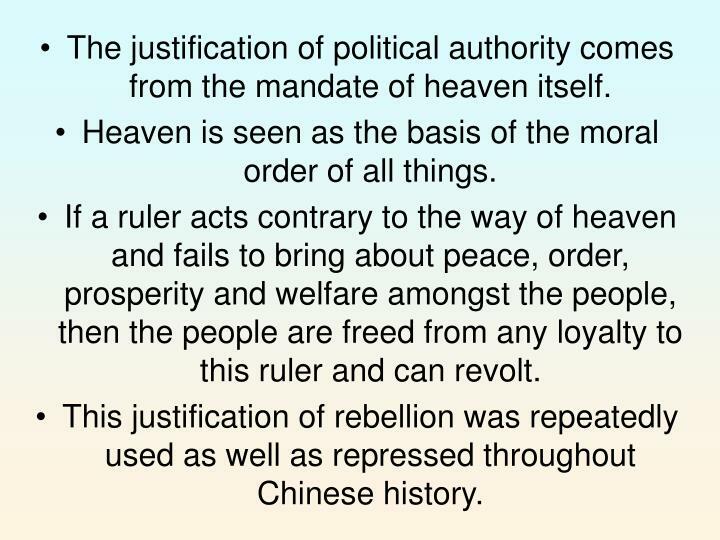 The justification of political authority comes from the mandate of heaven itself. Heaven is seen as the basis of the moral order of all things. If a ruler acts contrary to the way of heaven and fails to bring about peace, order, prosperity and welfare amongst the people, then the people are freed from any loyalty to this ruler and can revolt. This justification of rebellion was repeatedly used as well as repressed throughout Chinese history. 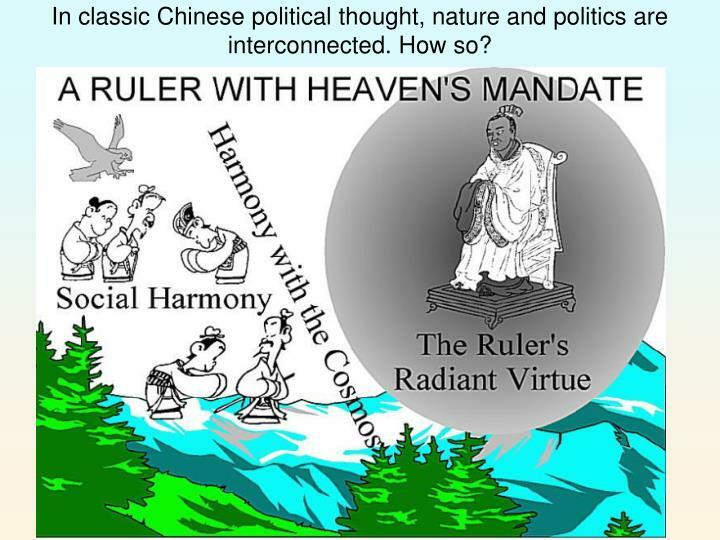 In classic Chinese political thought, nature and politics are interconnected. How so? 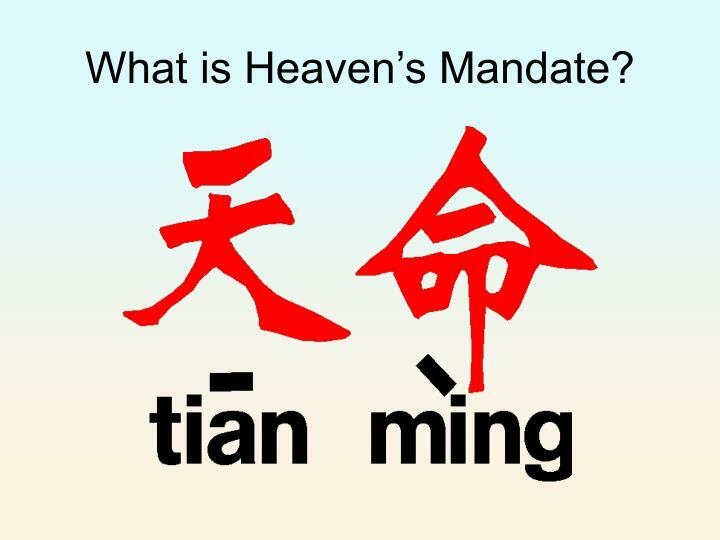 The workings of Heaven (tian) are constant. 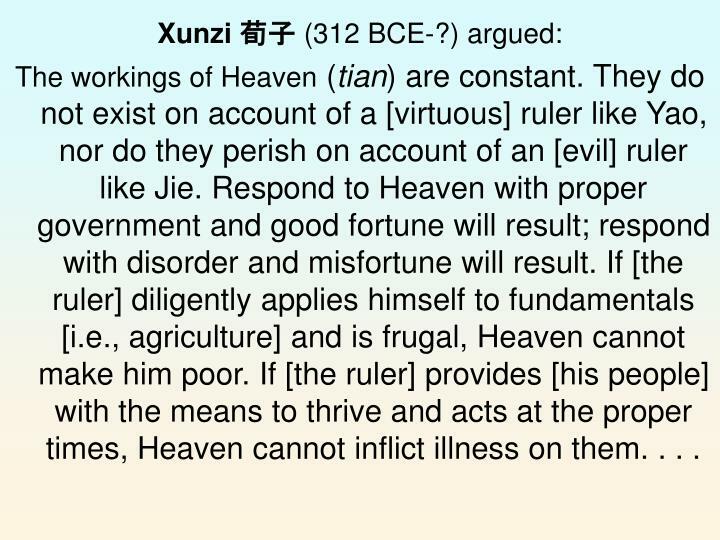 They do not exist on account of a [virtuous] ruler like Yao, nor do they perish on account of an [evil] ruler like Jie. Respond to Heaven with proper government and good fortune will result; respond with disorder and misfortune will result. If [the ruler] diligently applies himself to fundamentals [i.e., agriculture] and is frugal, Heaven cannot make him poor. If [the ruler] provides [his people] with the means to thrive and acts at the proper times, Heaven cannot inflict illness on them. . . .
… But if [the ruler] neglects the fundamentals [i.e., agriculture] and spends lavishly, Heaven cannot make him rich. If he does not provide [his people] with the means to thrive and is slow to act, Heaven cannot make them complete. . . . Do not get angry with Heaven for it is the inevitable, natural result of your own actions. Therefore, he who can distinguish between the activities of Heaven and those of humans is worthy of being called the most advanced sort of person. 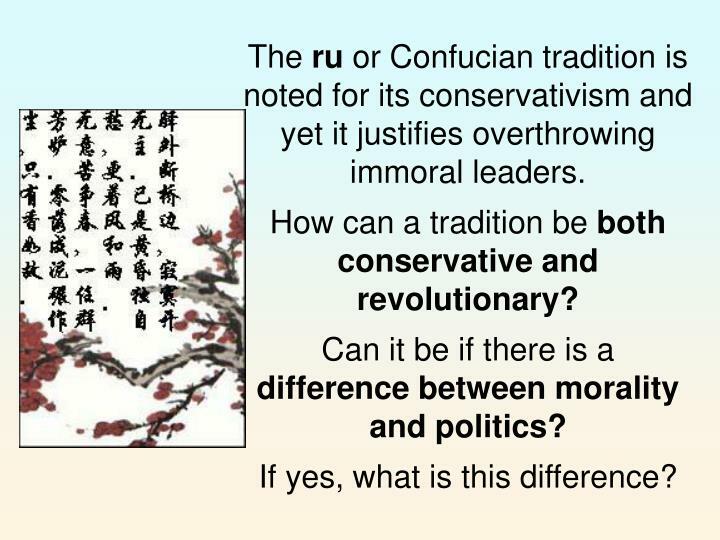 The ru or Confucian tradition is noted for its conservativism and yet it justifies overthrowing immoral leaders.How can a tradition be both conservative and revolutionary?Can it be if there is a difference between morality and politics?If yes, what is this difference? Zhu Xi (1130-1200 CE) lived during the Song dynasty and is often considered one of the four great Confucian thinkers. 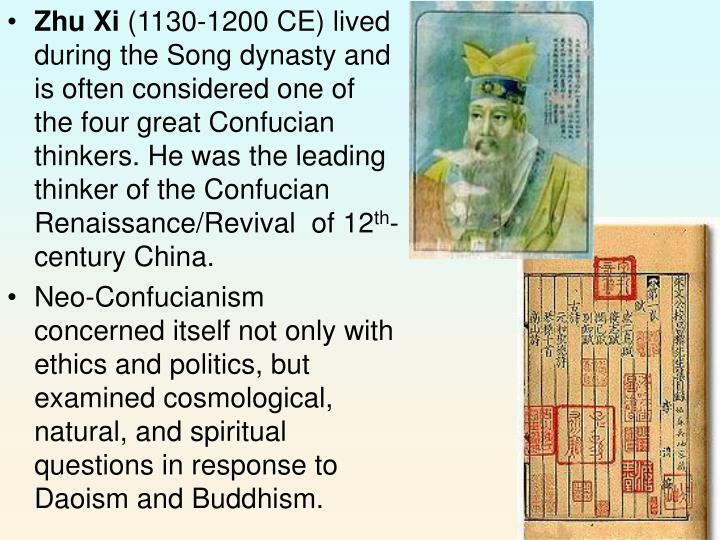 He was the leading thinker of the Confucian Renaissance/Revival of 12th-century China. 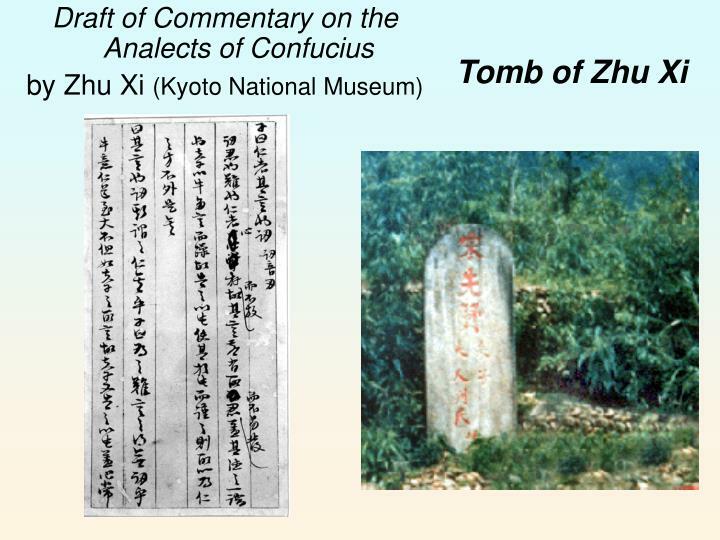 Neo-Confucianism concerned itself not only with ethics and politics, but examined cosmological, natural, and spiritual questions in response to Daoism and Buddhism. ESSAY THREE Due Next Tuesday! 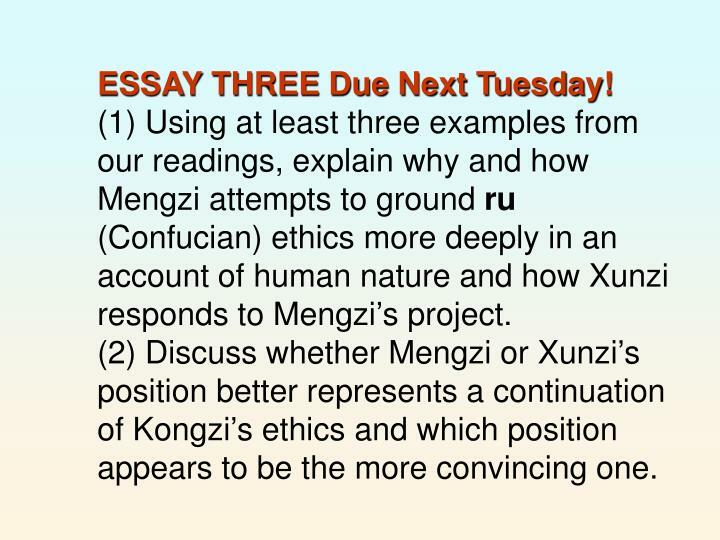 (1) Using at least three examples from our readings, explain why and how Mengzi attempts to ground ru (Confucian) ethics more deeply in an account of human nature and how Xunzi responds to Mengzi’s project. 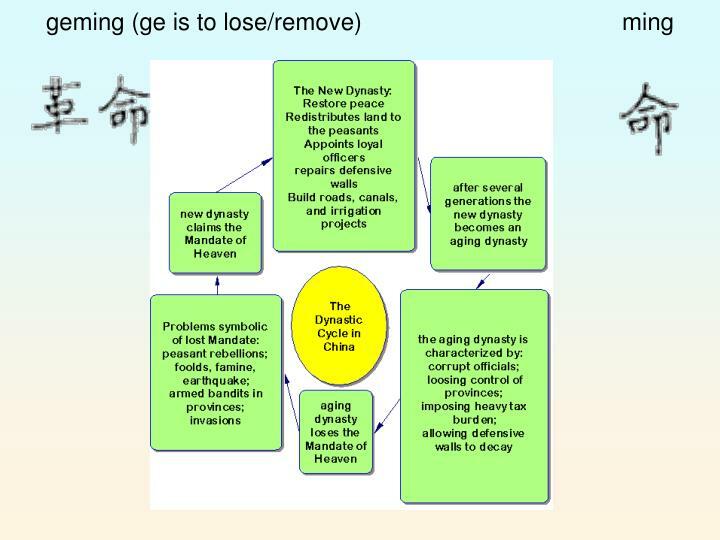 (2) Discuss whether Mengzi or Xunzi’s position better represents a continuation of Kongzi’s ethics and which position appears to be the more convincing one. 第九課 孟子選 孟軻 -. （一）「王道之始」章 （二）「舍生取義」章. http://zoucheng.com.cn/mengzi/pics/mengke6.gif. 課前引導. 孟子傳世的成語故事欣賞. 1. 揠苗助長 2. 齊人之福.